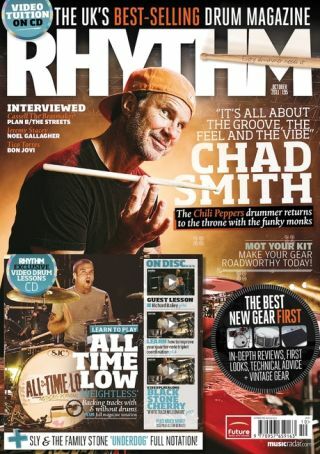 This month's Rhythm is on sale now and it's absolutely crammed-full of jaw-dropping drummers. Just to give you a taster of the chops within the 130 pages of the mag, we've dug out some clips of a selection of stars in the issue. Enjoy! In the issue: Chad tells us about the return of the Chilis, shows off two killer new kits and discusses his new-found love of odd time in our huge cover feature. In the issue: Hear more from Tico's tech about the Bon Jovi superstar's set-up. In the issue: Joby tells us all about turning junk into percussion instruments. In the issue: Tal talks life-changing songs in our The Track section. In the issue: We chat through Pete's illustrious career in the Rhythm Interview. The October issue of Rhythm is on sale now. For a full issue preview head here. To order a copy visit www.myfavouritemagazines.co.uk.